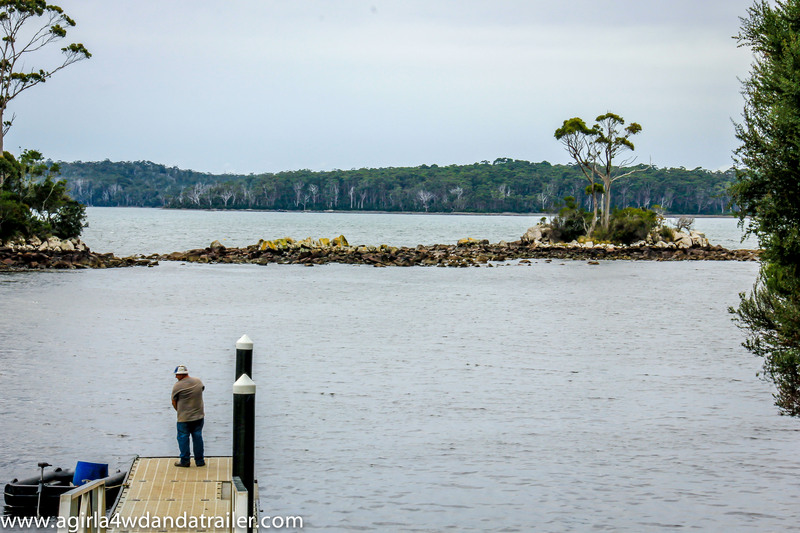 The day after our trip to Maggie Island I took a half-day off to myself without the Mr. We were staying in Rowes Bay so I walked along the boardwalk to Kissing Point and into the Strand. 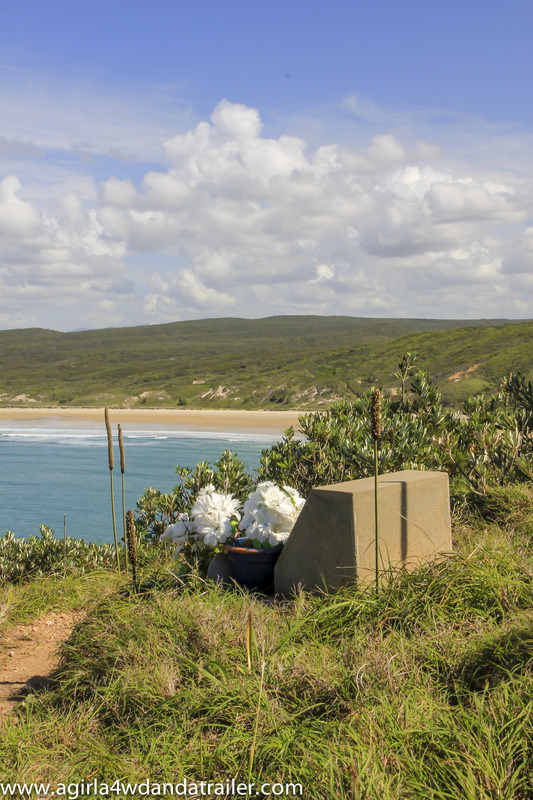 The Council had really excelled in the design of the facilities along the bay to the city. 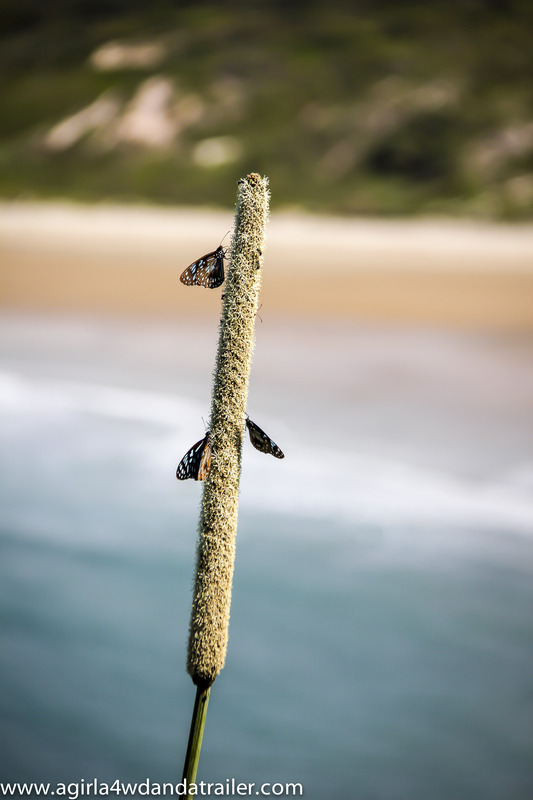 There are lovely parks, a brand new wooden boardwalk, local artist installations, mainly relating to Aboriginal culture, an outdoor museum at kissing point and then the Strand. It really was a stunning walk. I was so invigorated that I decided to walk the track up Castle Hill. Just for some context, I was on my own, it was really hot, I had no water. The climb was hell! But the views at the top were worth it! Then I did the very thing that everyone should do after a long hard walk, I walked to the brewery and had a beer or two at Townsville Brewery. 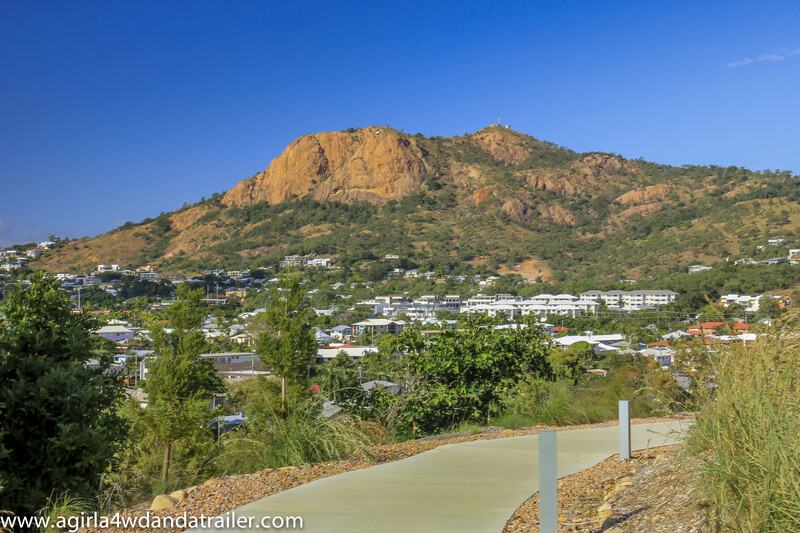 This walk was definitely the highlight of my time in Townsville! 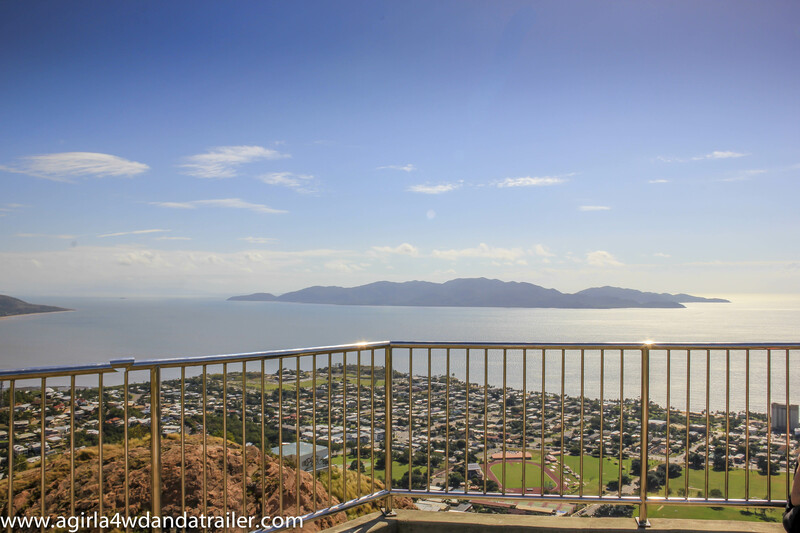 This entry was posted in QLD and tagged Australia, camping australia, Caravan Park Travel Australia, Castle Hill, Far North Queensland, FNQ, hiking, Kissing Point, lookout, Magnetic Island, Queensland, Rowes Bay, The Strand, Townsville, Townsville Brewery, Views, walking on June 11, 2014 by monicabugno. 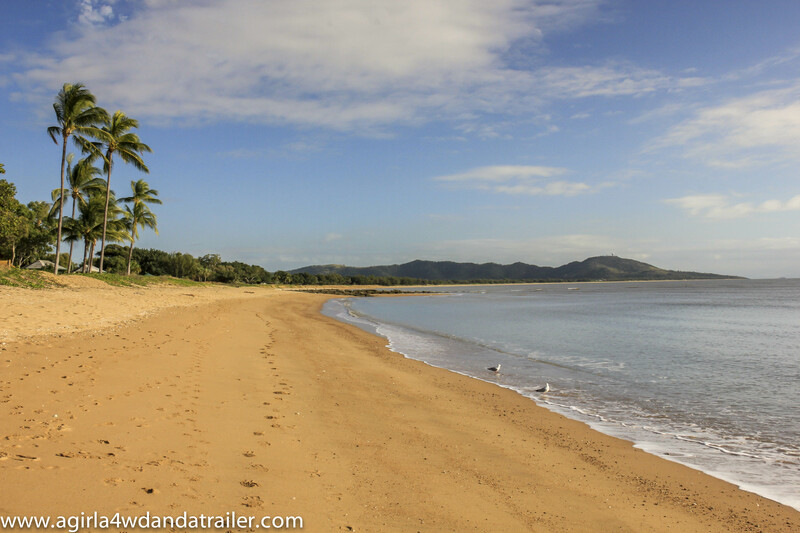 After 6 glorious days we left Byfield and resumed our journey north to Mackay. From this point forward we will be staying in caravan parks. I’ve never been up this far north and I want to spend some time in the larger towns. Unfortunately you don’t find free camps in bigger towns/cities so we have to stay in caravan parks for ease of access. 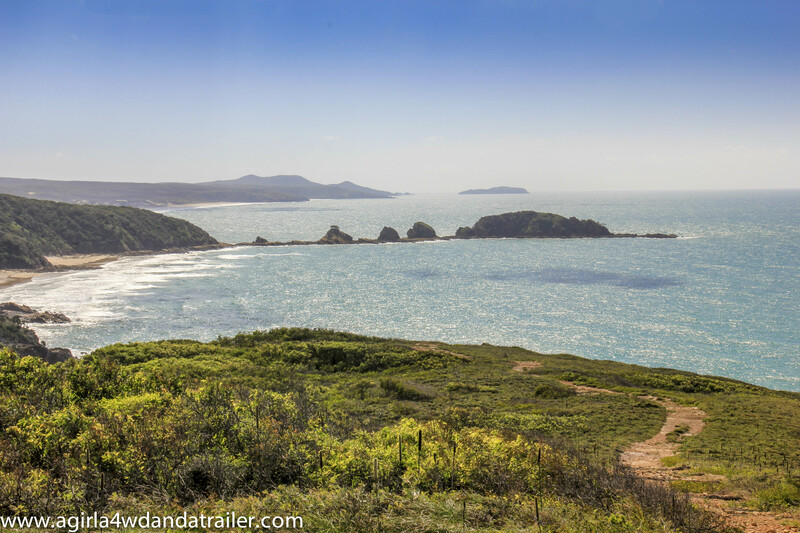 Anyway, the next stop was Mackay. I spent a couple of hours in Mackay CBD and while the historic building trail I was following was very interesting, the town itself was pretty average. 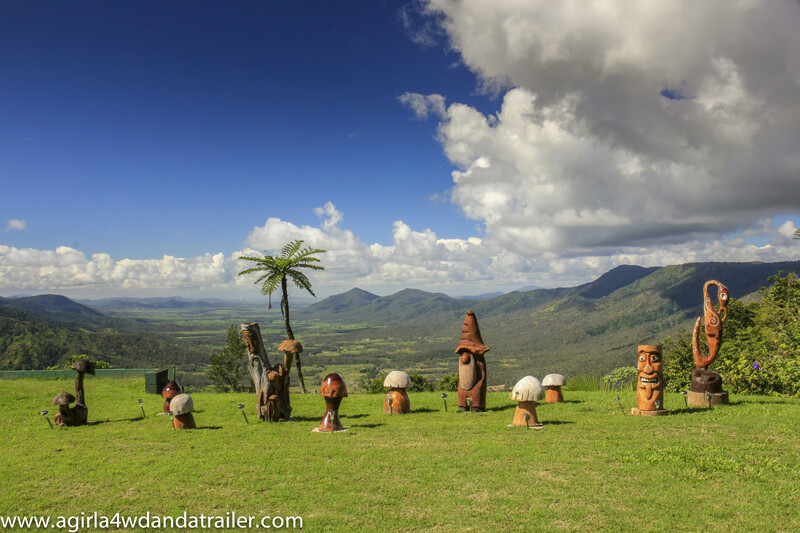 On one of the days we drove out to the Mackay hinterland, to Finch Hatton Gorge and Eungella National park / Township. 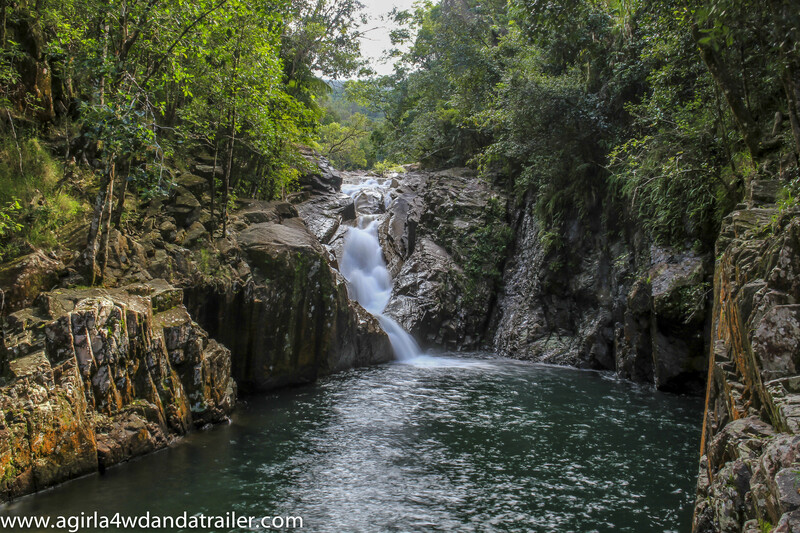 Finch Hatton Gorge is a beautiful secluded section of Eungella National Park. We did the short 1 hour walk to the Araluen Cascade Falls. On the way back we came across our first snake, a tiny baby black. We stamped and banged the ground and it slowly slithered away. 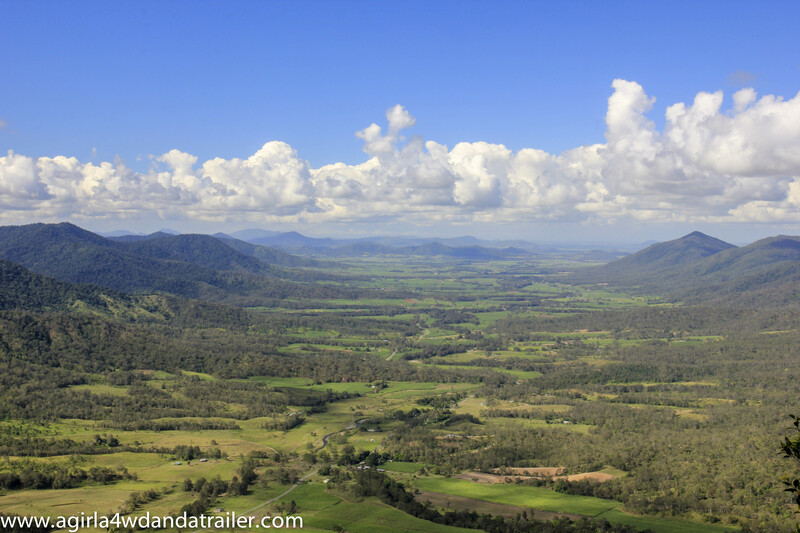 Eungella means “Land of the Clouds” and the township definitely embodies this being 1280m at its zenith. The drive up the mountain is not for the faint hearted, thankfully we weren’t towing at the time. 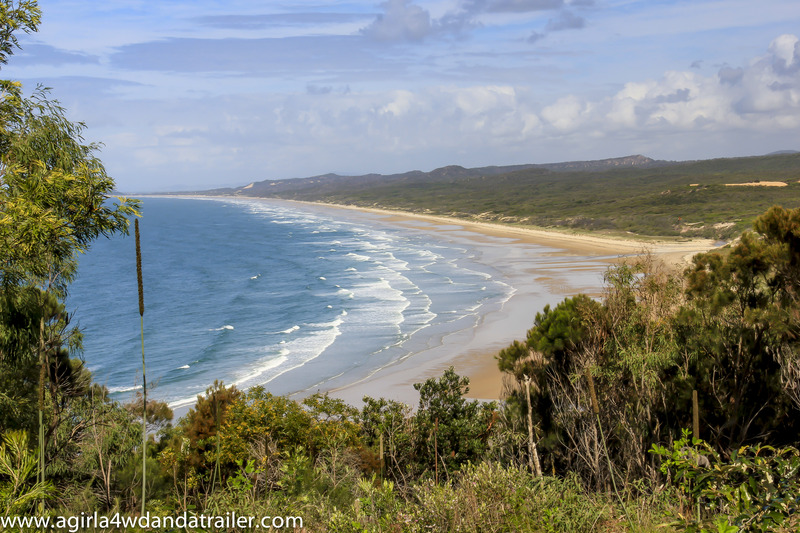 It is the oldest and longest stretch of subtropical rainforest in Australia and it’s been cut off from other rainforests for roughly 30,000 years. This has guaranteed that there are a number of strange critters not found anywhere else in the world. We did a couple of very short stops at lookouts around Eungella. A walk around the Historic Eungella Chalet where the backyard looks out over a cliff and a number of random woodcarvings have been placed. 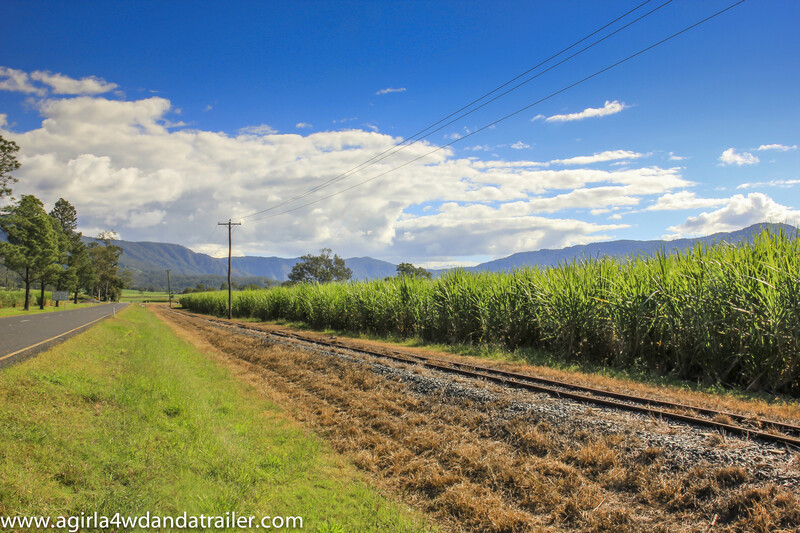 Then through the cane fields, with stunning mountainous backdrops, back to our campsite. 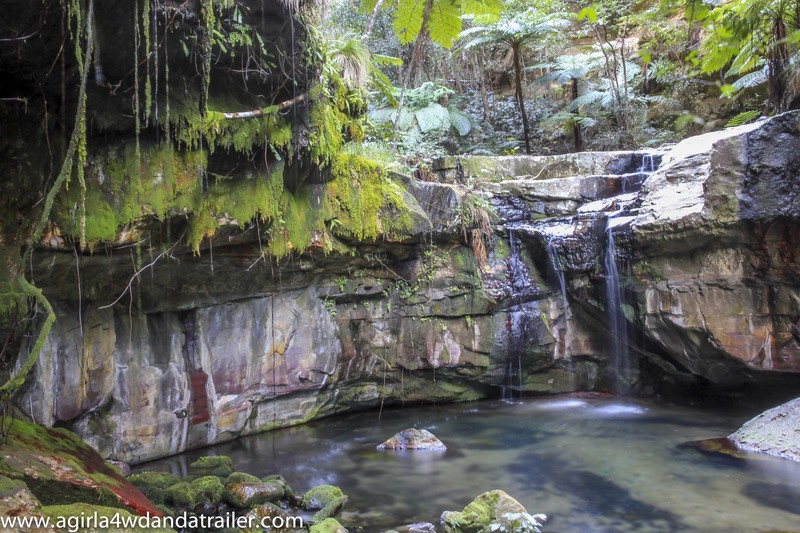 This entry was posted in National Parks, QLD and tagged Araluen Cascade Falls, Australia, australian travel, Budget Travel, caravan parks, day trip, Eungella National Park, Finch Hatton Gorge, hiking, National Park, outdoors, photography, QLD, Queensland on June 8, 2014 by monicabugno. 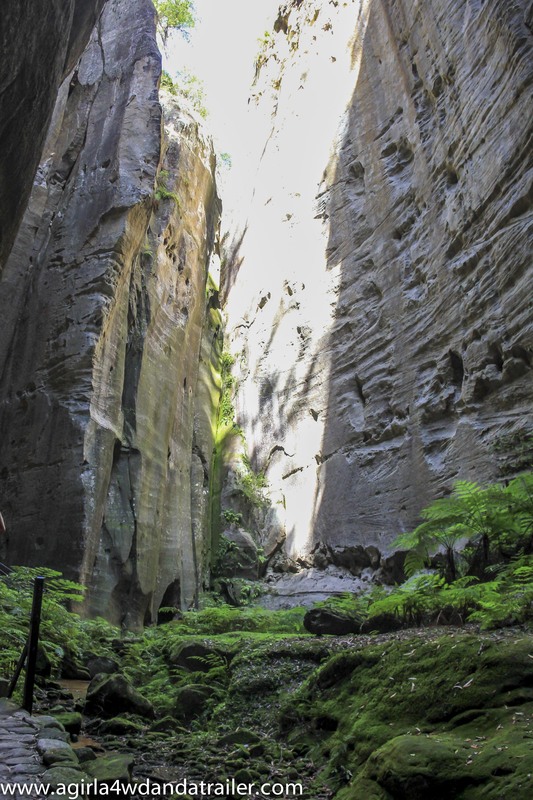 I can’t tell you of the first instance I became aware of Carnarvon Gorge, only that I knew it to be a place that was necessary to visit one day. 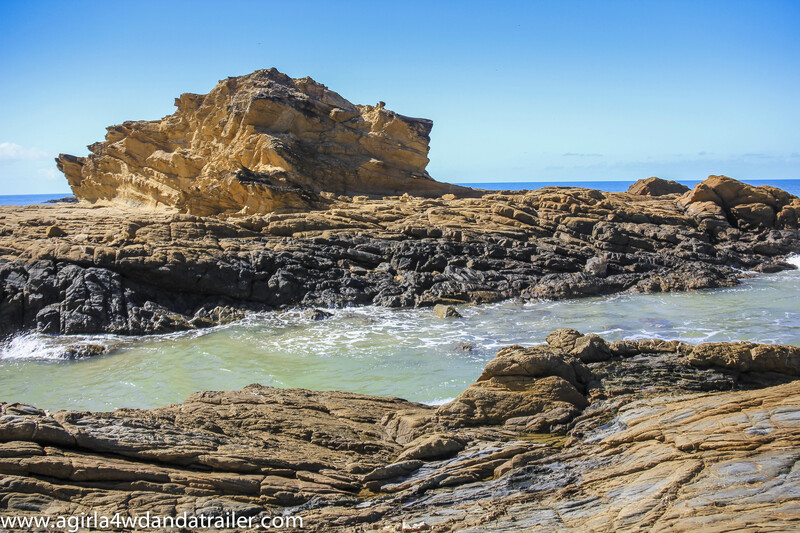 For thousands of years the Aboriginal custodians, the Bidjara and Karingbal tribes had lived in this area. In around 1850 white settlers had confiscated the land for farming, only to hand it back after vicious, but successful raids by the Aboriginals. 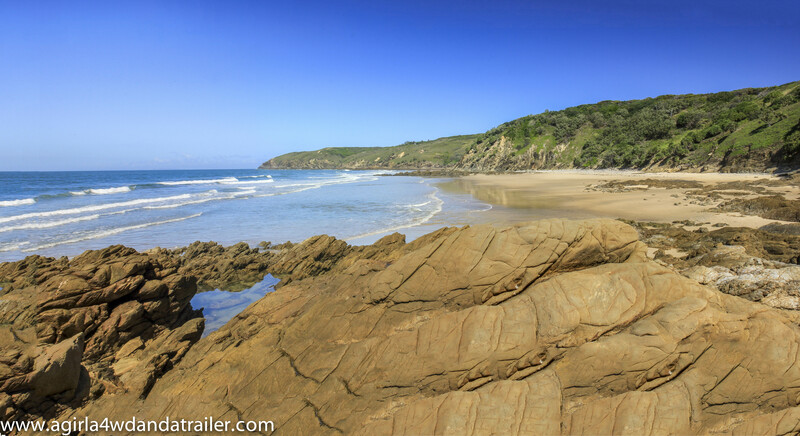 Today the spectacular sandstone cliffs form the towering walls of the gorge. The creek that formed the gorge over millions of years to this day continues to meander through the cliffs, sustaining a wide variety of flora and fauna to exist within the gorge walls. 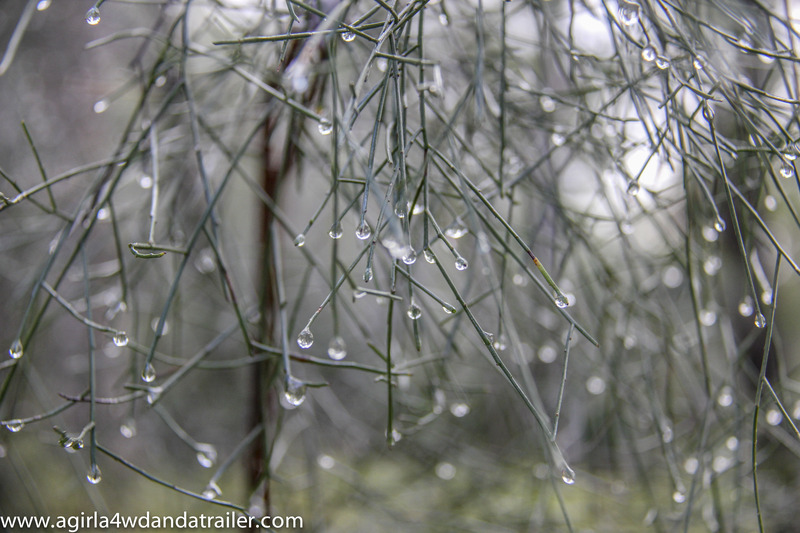 We stayed at Takarakka Bush Resort for 3 nights to give us 2 full days to enjoy the Gorge. Dripping water from the sandstone walls of the gorge have formed a tiny haven of moss and lush ferns, there is ever a little waterfalls. A 60meter deep chamber gouged from within the cliff. It was a cool, quiet place where we sat to have morning tea. 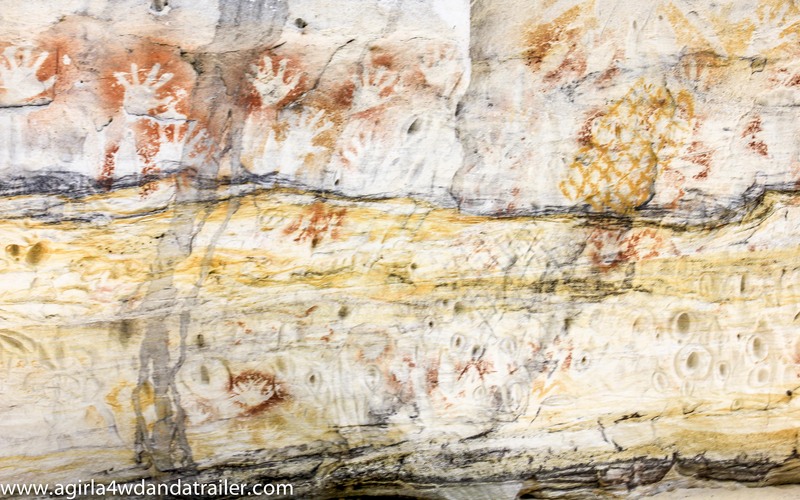 A 62 meter wall of sandstone records the history of the tribe from this area. This wall contains over 2000 stencils, paintings and carvings. Unfortunately, it have been vandalised in the previous decades. Boolimba Bluff gazes out above the cliff line of the gorge. We climbed a steep series of ladders to reach the lookout and once we made it to the top we sat and absorbed the view. 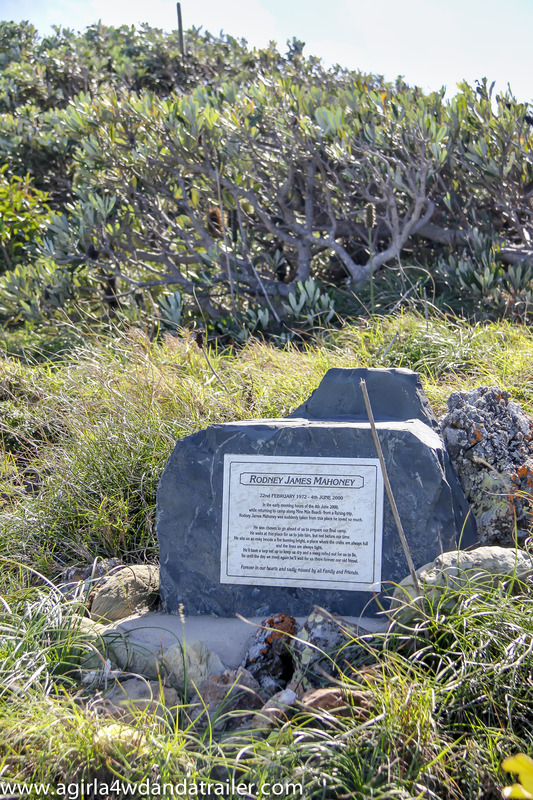 This entry was posted in National Parks, QLD, The Great Outdoors and tagged aboriginal, ampitheatre, art gallery, Australia, Australian history, boolimba bluff, camping, Carnarvon Gorge, carvings, gorge, hiking, history, moss garden, QLD, Queensland, rain, rock paintings, rock stencils, Takarakka Bush Resort on June 1, 2014 by monicabugno. We drove to Freycinet National Park (pronounced frey sin aye) for the 3 hour Wineglass Bay walking circuit, one of Tasmania’s 60 short walks. We were so lucky to have amazing weather, perfect for photos. 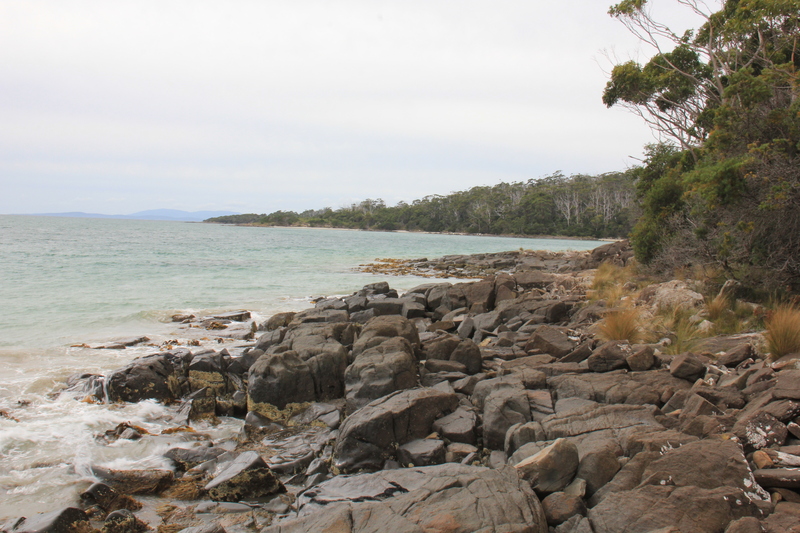 Originally we were just going to walk to Wineglass Bay lookout; however, I really wanted to walk down to the bay. I always see the lookout view photos, but never any of down in the bay. We stayed for 2 nights at the national park campgrounds. Both nights we had noisy neighbours who were up until all hours of the morning. There is nothing worse then camping next to inconsiderate people. Rant over! On the upside, the campground was right on Richardson beach it was just like having a private beach. After the Wineglass Bay trek I decided to get some colour so I walked right to the end of the beach, over some rocks and onto another empty beach, I could really get use to this! I also managed to get a couple of lovely sunrise shots at Richardson Beach. Unfortunately I missed out on the mountains been lit up red from the sunrise just by a couple of minutes. It’s amazing how you can miss a stunning shot just by being 2 minutes late, damn! There was still enough colour for some pics anyway. This entry was posted in TAS, The Great Outdoors and tagged Australia, australian travel, beach, camping, camping tasmania, freycinet national park, hiking, photography, richardson beach, sunrise, Sunset, tasmania, tasmania's great short walks, travel, wineglass bay, wineglass bay lookout on April 7, 2014 by monicabugno. 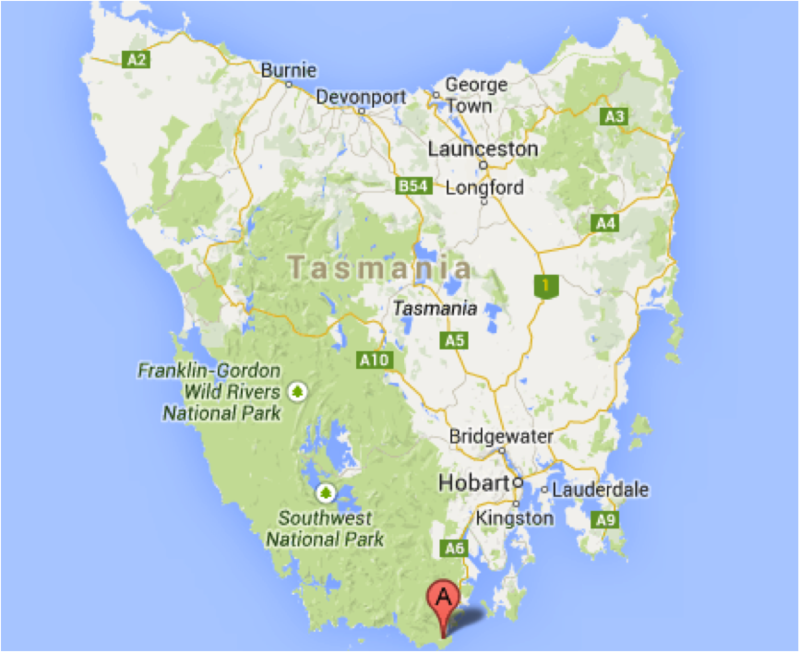 We decided to see how far south we could drive in Tas and this took us on the southern most road in Australia and to Cockle Creek. Cockle Creek is a tiny little southern Tasmanian settlement, one sign saying that population was 3! 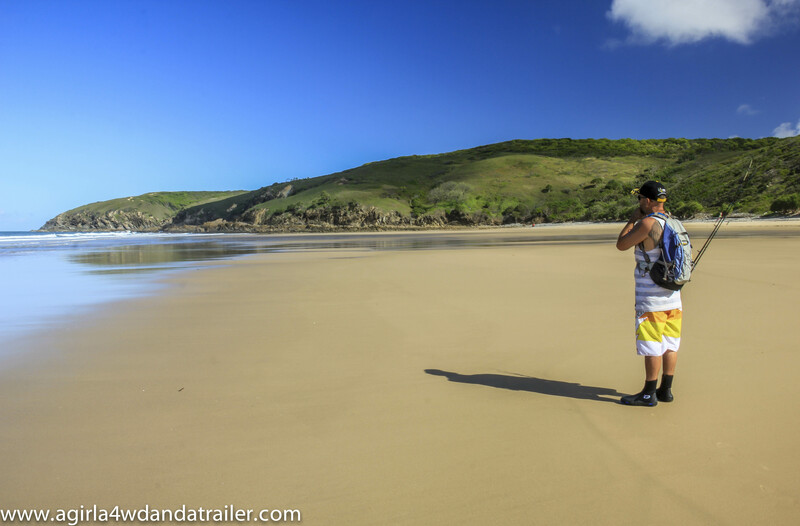 It seemed mainly consist of holiday houses, no shops or anything and campgrounds surrounded by national park. We followed a dirt road past all of the above and suddenly stopped into an area where you can turn the car around and go back. A bit of an anticlimax but at least we can say we’ve driven as far south of Australia as possible. 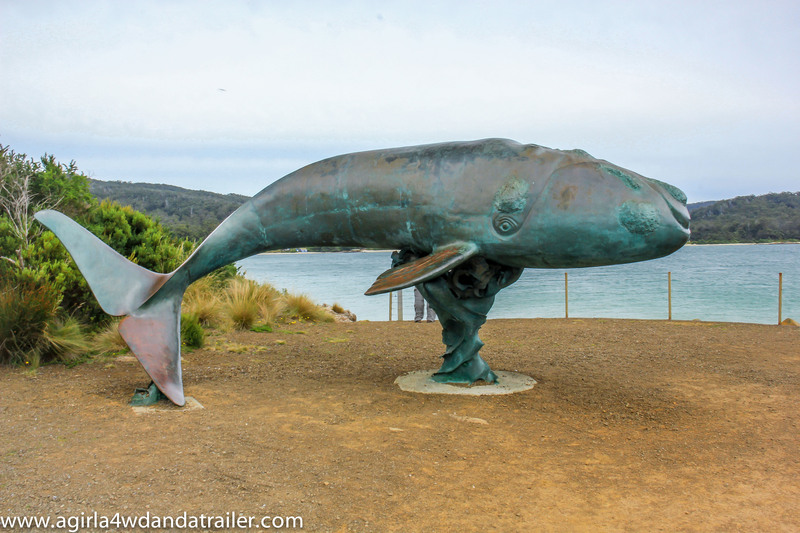 We stopped and go out of the car for a very quick walk to a giant bronze whale sculpture, sculpted in memory of the area’s whaling history. We also came across a cemetery. I love old cemeteries and this one didn’t disappoint. 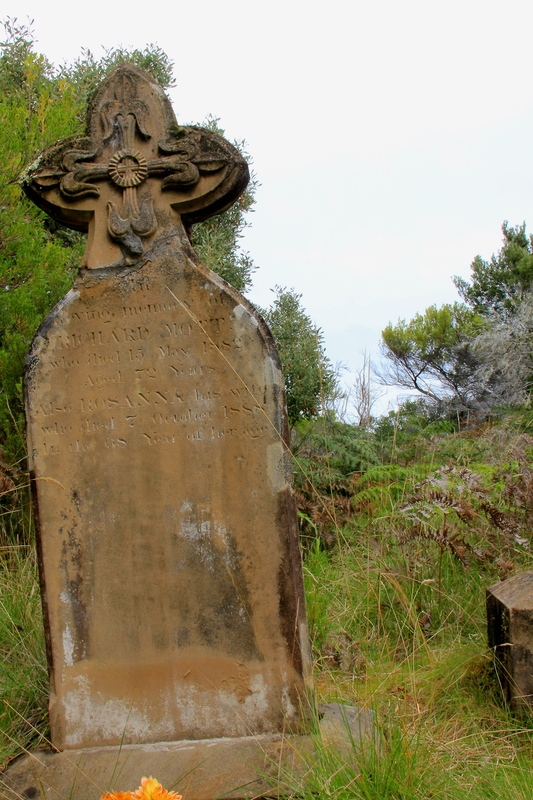 A number of headstones still exist scattered through the overgrown area; with a number that have disappeared overtime. 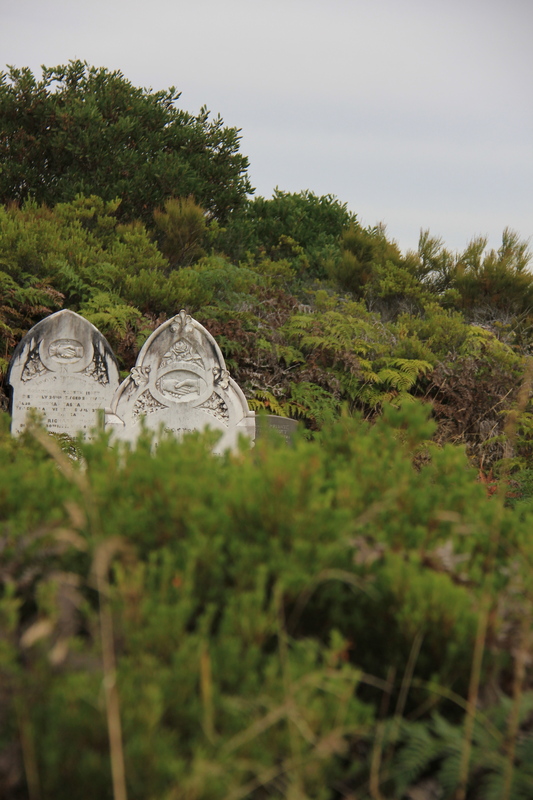 The headstones still standing are mostly legible with names and the information board states that a number of the descendants of the original settler families still live in the local area. The information board provides some fascinating history of the settlers who lived and died here. Some of the settlers died in mysterious circumstances, in tragic accidents, of disappeared suddenly and their bodies never been found. The conditions must have been very harsh; one family, the Adams, had 11 children with 8 dying before the age of 3. 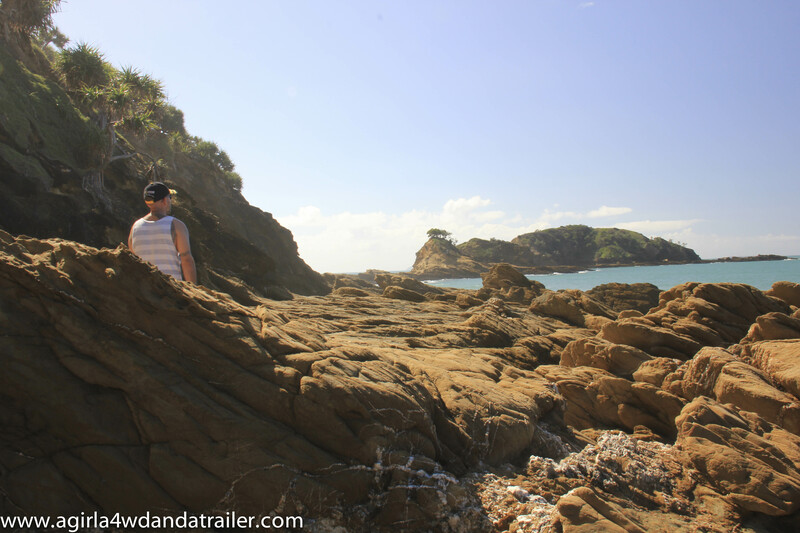 We weren’t able to camp in Cockle Creek this time as we are running short of time before we need to head back to Brisbane. I would love to come back and spend a few days relaxing though, definitely the place for some R&R. 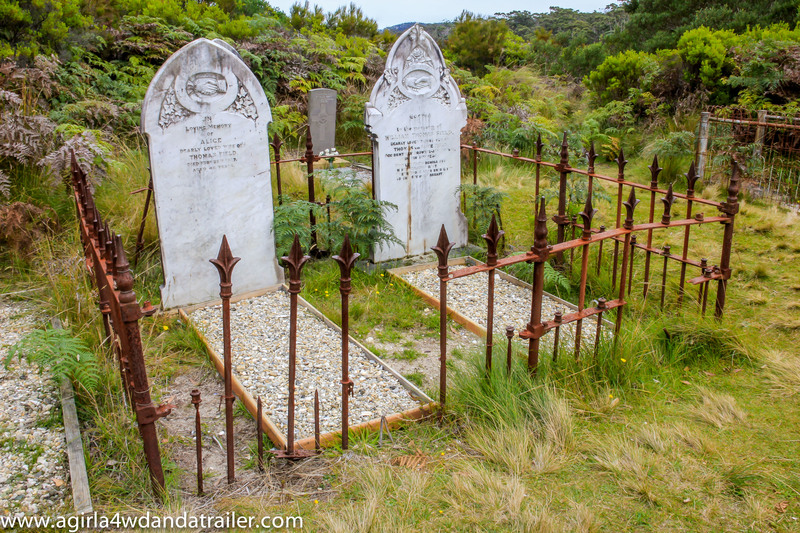 This entry was posted in Blog About The Great Lap, Cemeteries, TAS, The Great Outdoors and tagged Australia, beach, camping australia, camping tasmania, cemetery, Cockle Creek, headstones, hiking, history, old graves, settlers, travel, whale sculpture on March 29, 2014 by monicabugno.